New York: Rizzoli, 1990. cloth, hard cover in dust jacket., only slightest signs of use to dj, no tears, chips, creases. clean, no writing or markings. no bumps, strong binding. a very nice copy. ; 276pp., 320 illustrations, including 150 in color. seven essays and articles by various contributors. includes some documents, primary materials.. First American Edition. Hard Cover. Near Fine Plus/Near Fine Plus. Square 4to. Exhibition Catalogue. Keywords: Russian Modern Art. ; Soviet Modern Art. 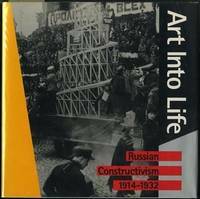 ; Constructivism.